Main Attractions: Unbelievable 360 degree views, farmland, open fields, dense forest. Mt. Alander - Climbing the trail to the top of Mt. Alander for the first time on a clear day is an experience you'll never forget. Awesome is a word used too often in today's society when people are describing things that are "fun" or "exciting". The views from Mt. Alander are awesome in the true sense of the word! There may be other mountains in the Berkshires with similar views, but none could exceed Alander for sheer viewing pleasure. If you are like me and hike to get a good workout rewarded with spectacular views, then you have to hike Mt. Alander. You can easily see a hundred miles in each direction if you hike on a clear day. There are many ways to summit the Mt. Alander and I took the Alander Brook Trail access with my brother who got me started hiking as a little boy over 25 years ago. The both of us were completely taken off guard by the views that unfolded before us. We had never known of the trail system at Alander...I had climbed nearby Mt. Everett and explored Mt. Riga and the Appalachian Trail nearby. The hike from the dirt parking lot to the summit is 2.5 miles and it's pretty much straight up all the way so you have to be in decent shape to attempt it. 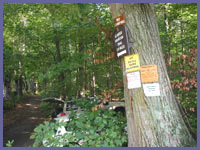 You follow the Alander Brook Trail to South Taconic Trail then follow the white hash marks north of South Taconic Trail to the summit of Mount Alander (2,250 feet) Total elevation gain from parking lot to summit is about 700 feet. You should buy a map and bring it if you aren't familiar with the Taconic Plateau and Mount Washington State Forest region. It's a very simple trail system to follow but it could be confusing to some accessing South Taconic Trail via Alander Brook Trail. AMC Massachusetts and Rhode Island Trail Guide (7th or 8th edition) is a good book that has a map of this trail system. A map called South Taconic Trails by NY-NJ Trail Conference is also a great map. Google or Amazon.com should bring them up for you to see where you can purchase them. Though never treacherous or severe in its slope, the trail rises through the forest in a manner that doesn't offer many flat sections. It can also be quite rocky as you near the summit. If you haven't been hiking in a while or are not in the greatest shape, you'll need to take it slow and rest a few times. But patience and persistence will pay off...I guarantee it. If you aren't thrilled with the views from atop Mt. Alander, there's no hope for you! From Alander you can see Mt. Greylock due north, Albany (80 miles away) north west, Mt. Everett east, and the Catskills west. The valleys below offer endless sites; farmland, forest, ponds, lakes, etc. The top of the mountain is a hikers playground. You can stretch out on some soft grass and watch the world go by, take a nap as the sun warms you up, stand on a number of rock "podiums" and strike the classic hiker pose as you look out over the valley below, follow the flight of a red-tail hawk, or pick some wild berries. My brother and I ran into a married couple from Switzerland who had come out to this region to pick wild mushrooms to help them create special soups and sauces. They assured me that the Swiss Alps are absolutely spectacular but that Mt. Alander is a real sight to behold no matter what you compare it to. They spoke of the variety of landscape in the Taconic Plateau that can't be seen in the Alps. We also met another married couple who are spending their retirement years hiking the Appalachian Trail. They also pointed out that the Mt. Alander section of the AT is as good as any you'll see on the trail. 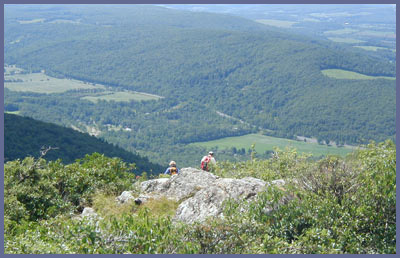 The Nature Conservancy has listed the Taconic Plateau region where Connecticut, Massachusetts, and New York meet as one of the last great places on earth. Hike Mt. Alander and you'll see why. Directions: For those coming from NYC or southern Connecticut take 84 west to the 684/Rt. 22 exit in Brewster. Take Rt. 22 north all the way to Millerton, NY (about 55 miles) Stay on Rt. 22 north as it heads up into Columbia County and the approaches town of Copake, NY. A few miles after crossing over Columbia County line (but before Copake) you'll pass some beautiful farmland on your right hand side. You'll see a golf course in the "Boston Corner" region of this area. A short distance later Under Mountain Road will be a right hand turn that you need to take. Not quite a mile (0.8 to be exact) down Under Mountain Road on your left hand side will be a dirt parking lot that is very small and easily missed if you are driving to fast. The dirt parking lot cutout is just after a cornfield following a long stretch of road. A large tree has signs posted signaling the trail head. If you're coming from the north (New York State or Massachusetts) find your way to Route 22 and the town of Copake. Head south on Route 22 from Copake and Under Mountain Road will be on the left. You can also map search and type in Under Mountain Road, Copake, NY. for custom directions on how to get to Under Mountain Road. There are other options as far as hiking up Mt. Alander. One way is to start at Bash Bish Falls State Park and follow the South Taconic Trail up to the peak. Maps are needed if you haven't ever been here or hiking without a local who has been there (see the 2nd paragraph above for map info). Another way would be to start at Mount Washington State Forest and hike in from there. There's a large trail map at the trail head that shows you the way. This last option is somewhat easier than the Undermountain Road option but Bash Bish option is probably the hardest of them all.